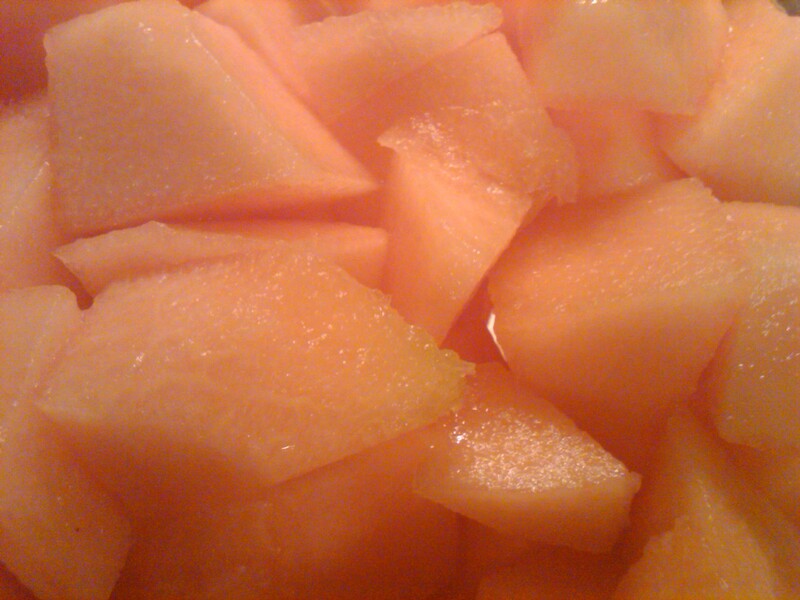 Yesterday I picked up a cantaloupe from Dillons. They were advertised as locally grown, and on sale. There’s no better win-win situation in the world! 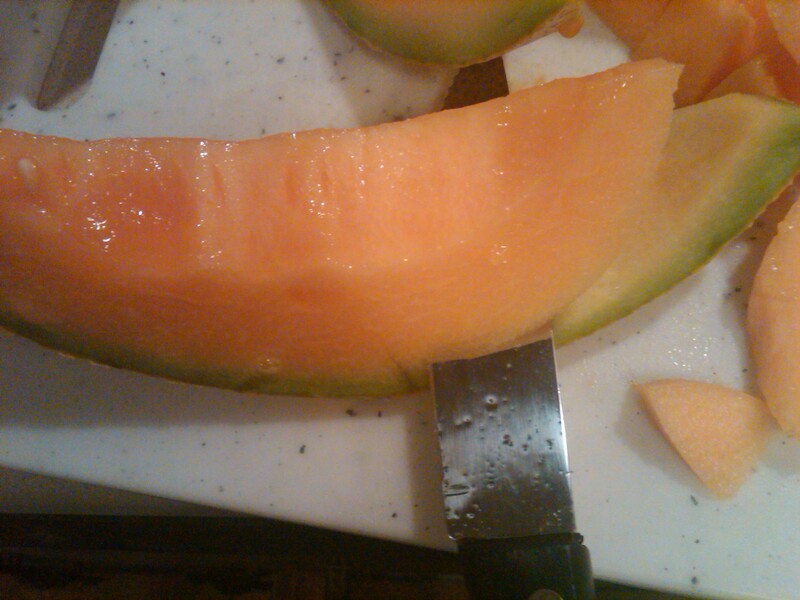 When I got it home and cut in to it, I instantly knew everyone in my life needed to have some fresh cantaloupe. So if you love the fruit but are intimidated by the prospect of cutting one (I used to be), this post’s for you! You don’t HAVE to have a cutting board to cut a cantaloupe, but I always use one for ease of cleanup (rather than getting the juices on the counter, I can dump them off the board). 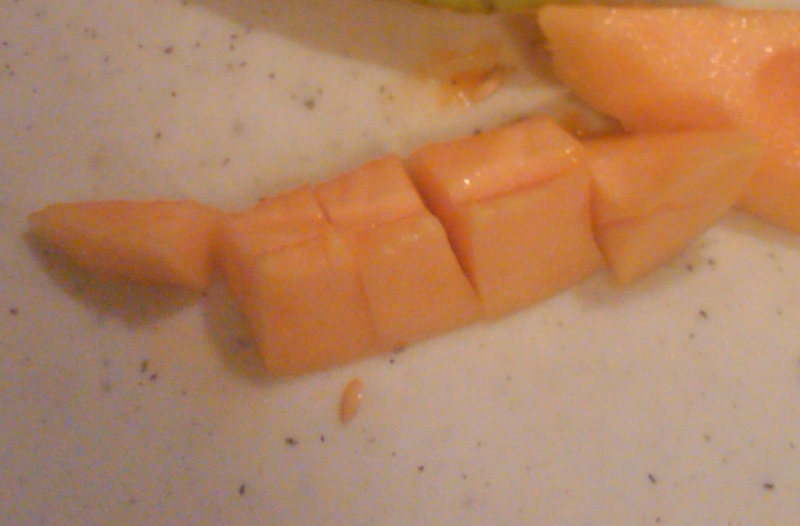 Take a sharp knife and if it’s a good cantaloupe the knife will go through the thing like butter. No, really. It will. I promise. 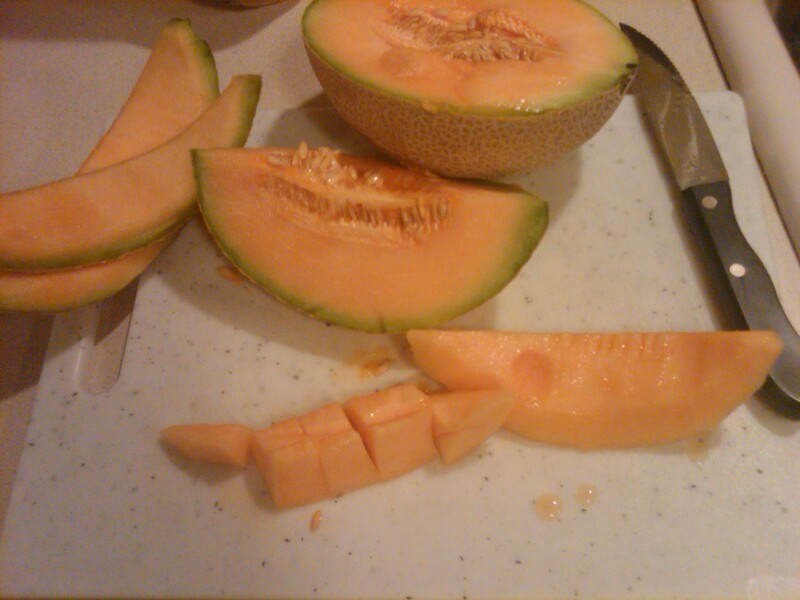 Cut the melon in half, length-wise. Then from there, cut it in half again (so now you’ll have quarters). See how there’s half a melon, then a quarter? Now you’ll take your knife and slice out the seeds. Once again, the fruit’s really ripe, so you’ll cut through it like butter. Generally I’ll hold the melon over the sink while I do this. 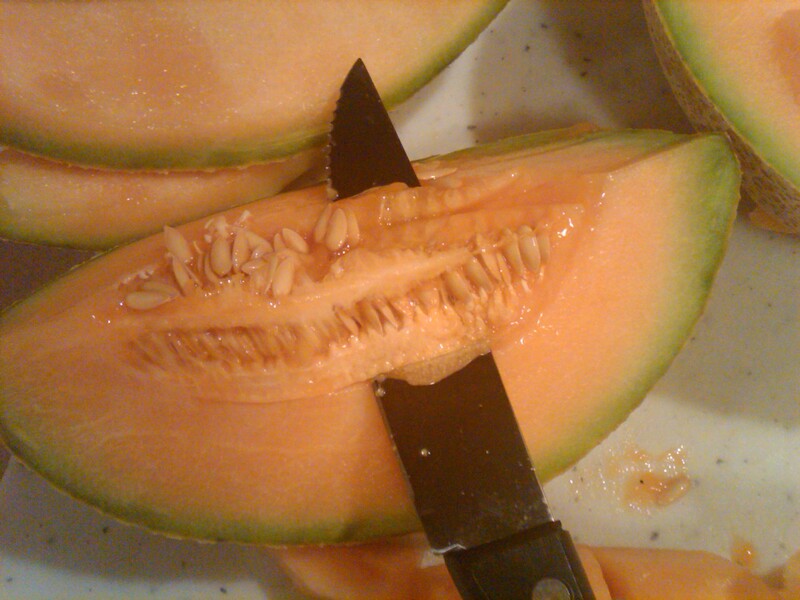 Hold the melon firmly (I have it sitting on my cutting board here, but normally I hold onto the quarter of the melon with my left hand and slice out the seeds with my right), and slice out the seeds. Kind of like I imagine it to be to take the skin off the fish. Only less, well, fishy. From there, follow the same technique to cut the flesh away from the skin. Try to cut as close to the skin as possible. If you get some of the skin it will probably taste bitter, but you can always cut that off as you’re chopping up the pieces. Then chop into bite-sized pieces. And enjoy. Simple, right? So go out and get one while they’re still on sale and in season! You know what’s easy too, is just using a spoon to scoop out all of the seeds. I had Maya help me do it and she had a blast. Less intimidating than a big knife and cutting the seeds out. Yeah, that’s true. If you have kids, give them the dirty work, like with a pumpkin! And it is soft enough!